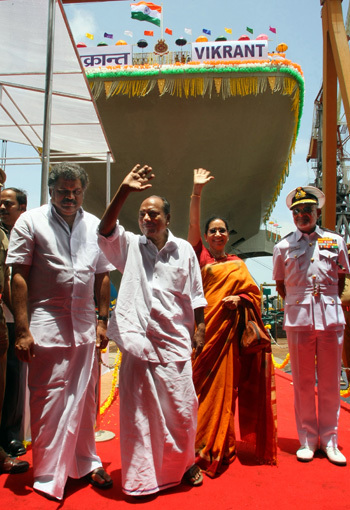 The glorious moment in the annals of India’s indigenous shipbuilding industry arrived amidst chanting verses from the Vedas at the Cochin Shipyard Limited (CSL), Kochi, on August 12, 2013, when indigenous aircraft carrier (IAC) was launched by Elizabeth Antony, wife of Defence Minister A.K. Antony. In keeping with the glorious tradition of honouring its former illustrious warships, the IAC was appropriately christened as Vikrant, India’s first aircraft carrier which was decommissioned on January 31, 1997. For a pathbreaking project such as IAC no other name would have been appropriate but the ‘Vikrant’ which in Sanskrit means ‘courageous’ or ‘victorious’. The traditional ceremony resplendent with graceful pomp and fervour, was presided over by A.K. Antony and witnessed by G.K. Vasan, Minister for Shipping, Admiral D.K. 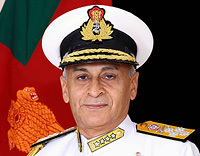 Joshi, Chief of the Naval Staff, Vice Admiral Shekhar Sinha, Flag Officer Commanding-in-Chief, Western Naval Command, Vice Admiral Satish Soni, Flag Officer Commanding-in-Chief, Southern Naval Command, Commodore (Retd.) K. Subramaniam, Chairman and Managing Director, CSL, and other officials from the Ministries of Defence and the Shipping. Also present on the occasion were numerous naval officers, shipyard staff and workers and the officials from the Steel Authority of India Limited (SAIL), the manufacturer of the indigenous warship grade steel. The aircraft carrier was floated out of drydock then re-docked in order to mount the propulsion system. Work will now begin on the deck and the weapon systems before sea trials. While Defence Ministry officials say those trials will begin by 2016, Indian Navy sources say the ship will be handed over by end 2018. The formidable profile of hull structure, imposing ramp for short takeoff but arrested recovery (STOBAR) of 37,500-tonne-strong Vikrant proudly demonstrated the rare indigenous design and shipbuilding capabilities that India has acquired on its own. The designed length of the ship is 260 metres and the breadth is 60 metres. Over 80 per cent of the structure, containing about 2,300 compartments has been fabricated, over 75 per cent has been erected, all the major machinery, such as the two LM2500 gas turbines developing a total power of 80 MW, the diesel alternators capable of producing about 24 MW and the main gear box have been fitted. The Defence Minister described the occasion as momentous and said, “Today’s launch of the IAC marks just the first step in a long journey but at the same time an important one.” He said it was indeed a proud moment for the country to witness our efforts at achieving self-reliance in the field of warship design and construction as only a very few advanced countries in the world possess the capability to design and build aircraft carriers. Vikrant is the first ever aircraft carrier to be designed by the Directorate of Naval Design of the Indian Navy, the first warship to be built by CSL and the first warship to be built entirely using indigenously produced steel by SAIL. The construction of the ship is a truly pan Indian effort with active participation of private and public enterprises. The main switch board, steering gear and water tight hatches have been manufactured by Larsen and Toubro (L&T); the high capacity air conditioning and refrigeration systems have been manufactured by Kirloskar; most pumps have been supplied by Best and Crompton, Chennai; Bharat Heavy Engineering Limited is supplying the integrated platform management system; the massive gear box is supplied by Elecon in Gujarat; the tens of thousands of electrical cable is supplied by Nicco industries in Kolkata and it is Kolkata where the ship’s anchor chain cable are also manufactured. Vikrant will be capable of operating an aircraft mix of the Russian MiG-29K and LCA (Navy) fighters being developed indigenously by the Hindustan Aeronautics Limited (HAL). Its helicopter component will include the Kamov 31 and the indigenously developed advanced light helicopters (ALH). The ship’s ability to sense and control a large air space around it will be enabled by modern C/D band early air warning radar, V/UHF tactical air navigational and direction finding systems, jamming capabilities over the expected electromagnetic environment and carrier control approach radars to aid air operations. Long-range surfaceto-air missile systems with multi-function radar and close-in weapon system will form the protective suite of the ship. All weapon systems onboard the carrier will be integrated through an indigenous combat management system, being manufactured by Tata Power systems. 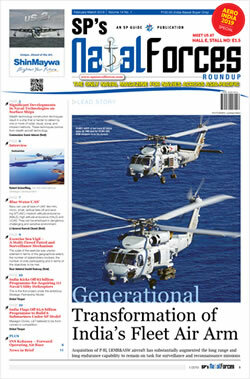 The ship’s integration with Navy’s network-centric operations will provide force multiplication. An indigenous design and development of an aircraft carrier had been in the works of Directorate of Naval Design since the late 1970s. Initially, the project was obliquely designated as the Air Defence Ship to thwart possible hostility from the Indian Air Force. Since the induction of INS Vikrant in 1965, Indian Navy has operated only the off-the-shelf procured aircraft carriers duly modified and refurbished depending upon availability of fixed-wing aircraft to operate from its decks. In parallel, the mission to design and develop indigenous aircraft carrier was relentlessly pursued. Phase I launch of rechristened Vikrant has turned a new leaf. Henceforth, India would not have to look for import options, other than collaborations and joint venture arrangements for transfer of technology, consultancies in specific areas where ab initio research and development (R&D) would not be cost effective and cause delays. However, the dependency for the carrier-borne fighter and reconnaissance aircraft, weapon systems, controls, auxiliary and other niche areas would be unavoidable. At the curtain raiser for the launch, on August 1, 2013, Vice Admiral R.K. Dhowan, Vice Chief of Naval Staff, described the launch as the “crowning glory” of Indian Navy’s indigenisation programme. He highlighted that apart from domestic design and manufacturing work, it is the high grade warship steel made by SAIL which has significantly contributed to indigenisation and cut down requirement of import for all ongoing and subsequent shipbuilding projects. The indigenous component in the warship would be approximately anywhere between 80 and 90 per cent in ‘floating’ department, up to 60 per cent in ‘movement’ and not more than 30 per cent in ‘fighting’ component of the carrier, he added. Further, pointed out that all options were open including the nuclear propulsion system, technology upgrades such as catapult assisted take-off but arrested recovery, electromagnetic assisted launch system for design finalisation of IAC 2 and follow-on IAC programme. Vikrant will now enter the most vital Phase II of outfitting, fitment of various weapons and sensors, integration of the gigantic propulsion system and integration of the aircraft complex, with the assistance from Nevskii Design Bureau, St. Petersburg, Russia. The ship will then undergo extensive sea trials and the crucial aviation trials before she is operationally inducted by end 2018. Now it can safely be assumed that the imponderables in the IAC programme have been effectively overcome. Commissioning of Vikramaditya by the end of the year should also provide desired impetus in the operationalisation of Vikrant. Two stupendous achievements accomplished two days apart from each other; the nuclear reactor of Arihant achieving critical threshold and launch of Vikrant, both heralded the grand entry of India into two elitist shipbuilding domains of nuclear submarines and aircraft carriers. Indeed a matter of national pride!